Did EA Get it Right? Video-game dork alert. You’ve been warned. 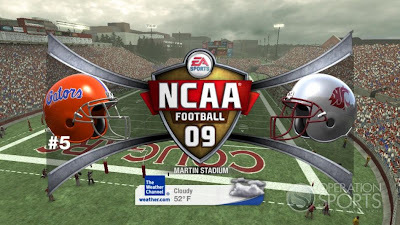 EA Sports will be releasing the newest version of their stellar NCAA Football series, NCAA Football ’09, in mid-July. Part of the hype surrounding the release has some web sites with an early build of the game, and they have been showing off some screens of what things will look like this year. 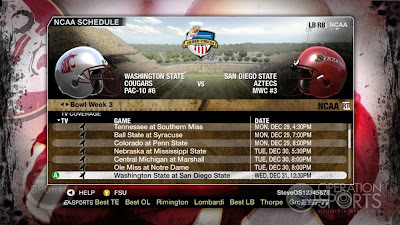 For WSU fans, I have to say it looks promising. 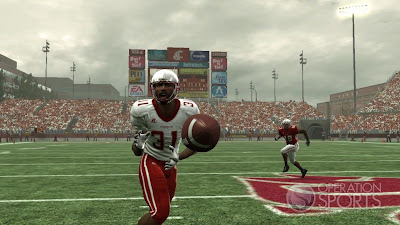 For the first time on the “next generation” machines (Xbox 360 or PS3), Martin Stadium will make an appearance. 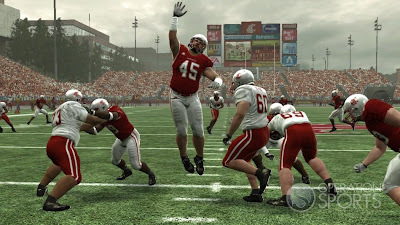 For the first couple of releases on the new machines, they went with a “generic” stadium that really looked nothing like Martin. But this year they’ve finally got it right. 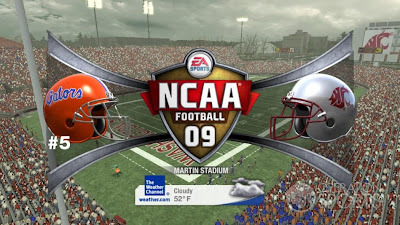 Part of the issue is that EA really took the next step with these stadiums, where in some interviews claiming they personally went to as many D-1 stadiums they could and took tons of photos from every conceivable angle. Even to the extent that they say the setting within 1 mile around the stadium would be accurate. 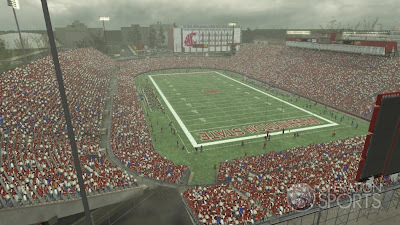 So did they get Martin Stadium right? First, this shot facing the practice field. You can see that they got the stands right, and the entrance is in the right spot. But it looks like they missed the Cougar Pride banner over the tunnel. Oh well. Still, it looks pretty accurate. You can even see the roof of the Field House. Here’s a shot facing stadium way. Look to the top-left, and you can see the practice bubble. The press box looks pretty good as well (compare this shot with the shot in the header of our site and you can see they did a good job). The WSU banner is gone in reality, isn’t it? Has that thing ever been recovered? It doesn’t look like they got the renovations into the game, as this year things will look drastically different on the Stadium Way edge. 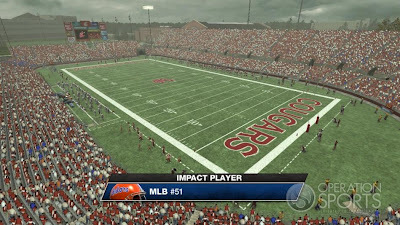 Another look towards the practice field (Florida at Martin Stadium?? WTF?). Again you see the press box and that looks perfect. They also got the CUB, and you can even see some lights reflecting off the windows. Pretty cool. Unfortunately they have our old scoreboard as well. Oh well, maybe next year. Another look towards Stadium Way. To the bottom-right, you can see a group of fans in Florida blue. Nice touch, having the visitors section in one area. But they are on the wrong side of the stadium. SO FAKE! Now for a couple of in-game shots. First, Andy Mattingly leaps into the air to try and knock down a pass. Again, a good look at the stadium and it looks good, even though the scoreboard is outdated. You can see the Field House to the top-right as well. But the numbers on the shoulders are odd. I must have missed how we moved those around, unless we’re changing things this year? Weird. They had it right last year. 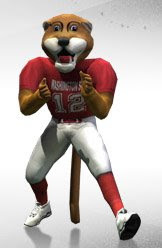 Finally, according to EA, we’re GOING TO THE ARMED FORCES BOWL! We’ll face off against the hated San Diego State Aztecs, the 3rd seed from the Mountain West. It’ll be SO ON. So there you have it. It’s not perfect, but it is better than it has been in years past. It is nice to see them giving WSU a little love. So why a post about video games? Because it’s May, that’s why. What, do you want to rehash all the off-field garbage that has been the off-season of ’08? Neither do I. But I also bring this up because we’ll be simulating each game this season, the week before each game is played. It should be interesting to see how things play out in the video game realm and compare it to reality. We will upload a few videos from each game as well. 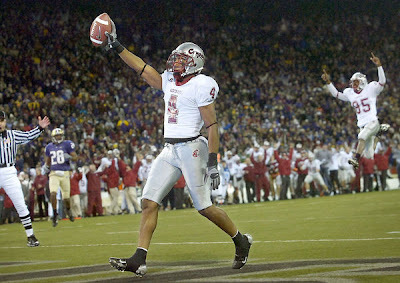 I know ESPN does this sort of thing with the biggest games of the week, but we’ll do it for our Cougs. FINALLY, saw Indiana Jones over the weekend. In a word: “Meh“. If you are a fan of the Indy series, you might get a rise or two out of it. But for the most part, I thought it missed the mark. And that’s from someone who LOVES the original. Believe me, I really wanted to love this one too. But it missed. It’s hard to say why. Maybe because he’s 65 and has lost a few steps, maybe the story wasn’t that great or the villain wasn’t anything to fear (Cate Blanchett with a Katie Holmes hair cut and bad Russian accent?). Maybe Shia Lebouf pretending to be Fonzie was a mistake. I don’t know. Maybe it was the lame ending. Or worst of all, maybe it was all the CGI that Lucas and Spielberg mixed in. That was one of the beauties of the previous movies, in that they were gritty, dirty, and full of great stunts and excellent acting. Sure it was fake, but it felt somewhat “real”. Not this movie. It might be worth a matinee if you are looking for something to do, but I wouldn’t go with a premium time to see it. You are currently browsing the archives for the Indiana Jones category.